​There aren’t many teachers out there who spend their entire career teaching one particular grade level. But there are a few. Thankfully, I am one of those lucky teachers. But don’t get me wrong, it wasn’t easy. And I had to fight to keep it that way. There is no greater expert on a particular child age, than a teacher who has spent years working with them. The teacher gets to know the greatest challenges of the age along with the greatest joys. Teaching 6th grade is what I know. It’s what I love. It’s what I’m good at. I taught self-contained for 5 years – preparing students for middle school. Then I became a middle school teacher, helping them adjust to new challenges. Challenging students and helping them succeed was my bread and butter. “She can teach rocks,” is what my evaluator would say. ​So when my administrator came to me one spring and said, “I need you to teach something else this fall.” It was pretty much a punch in the gut for me. Luckily, I was able to stick to the same grade level. But I had to teach an elective class. Apparently it was a numbers game, and there weren’t enough elective classes for all of our 6th graders. But my forte was teaching academics. How was I supposed to teach something like computers or home economics? And the idea of teaching a study skills class was born. ​Instead of using my techniques to help students succeed in my class, I was now tasked with teaching these techniques and helping students see success with using them in other classes too. What a challenge. And where to begin. 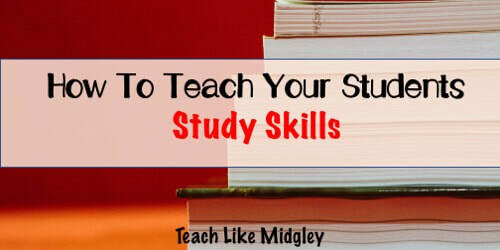 There are quite a few mini lessons or activities out there for teaching study skills, and it’s fair to say I read through quite a few of them. But there was nothing that was going to sustain 9 weeks. I also wanted the course to be more than just a pile of mini activities from random books. I wanted the course to provide the guidance to students that I provide in my social studies class. And I wanted to find a way to help students apply these skills in other classes. I spoke to my colleagues about what they see their students struggling with in their classrooms. I was working to gather a collection of universal skills that would benefit students. My goal became to combine what I do in my regular classroom, with the needs other teachers see in their students, with skills that would benefit students throughout their academic careers. ​When I lesson plan, I must first start with the entire course overview. When does the class start and when do I want to give the final test. Then I fill in the objectives I want to meet in-between. I always use the calendar to judge how much time I spend on each objective. After that, activities start to fill themselves in. While I came up with 6 main objectives to focus on, there were also a few other things that were continuous throughout the course. Effectively using a planner on a daily basis was a skill several of my colleagues mentioned students needed help with. Using the planner became the focus for homework I assigned for this class. Helping students recognize what they could do as individuals to better their grade in any class, became another focus. Too many students are quick to assume that extra credit will raise their grade every time. This is obviously not the case, and not every teacher offers extra credit. This became another skill I focused on weekly. Consider the first week is for expectations, introductions, and learning about the syllabus; while the last week includes the final test and fun wrap-up activities. That leaves 7 weeks between to be filled with my 6 objectives. Each objective was provided about a week, while chapter 4 would take 2 weeks. Then with incorporating the planner and grade improvement throughout, my course had written itself before I knew it. ​When my study skills class first came to be, counselors were eager to enroll their struggling students. An interesting thing happened. But not in a good way. We all have those few students in our class that really struggle just to complete anything. While having one or two of these students in class is manageable, having twenty-four of them is NOT. I didn’t feel like I was getting anywhere, and I was banging my head on the wall daily. Why was I doing this? Was my course that unreasonable? I went and spoke with the counselors about what we could do. While I agreed these kiddos needed help, it was just unrealistic for me to have an entire class of students who were failing every academic class. What they needed was motivation, and I was struggling to give it to them. So we decided to make a change. I specifically asked for students who were earning Cs and Ds in their classes. These students were obviously trying, but not doing as well as they could be. As we evaluated grades every week, I started to see grades improving, all because of what students were doing for themselves. Seeing this success also helped my major strugglers. They started seeing other students make improvements with little changes. And in turn, they started to give things a try. 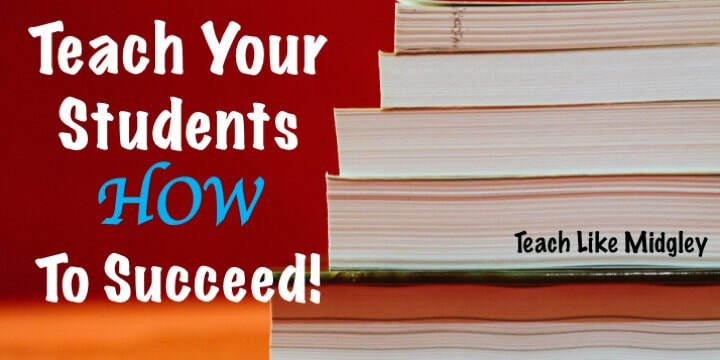 ​While my study skills course was not a magic potion for all students, I feel confident that based on rising grades, rising attitudes, and changes other teachers saw in their classrooms, that it DID make a positive difference in helping students succeed. Not all students understand what it means to be an academic success. I think teachers and parents sometimes forget that their kids need to be taught the skills to be good students. Just telling them to “do your homework” and to “study” every night is not enough. We must teach our students how to study. We must teach them how to use a textbook efficiently. We must teach them how to be successful academic students. Using this Study Skills course I developed, I have since taught my Study Skills class for three years, and helped two colleagues teach the same class. I have now transformed my course into a full curriculum for purchase by other teachers who are also looking to teach their students how to be successful and see some amazing things happen. 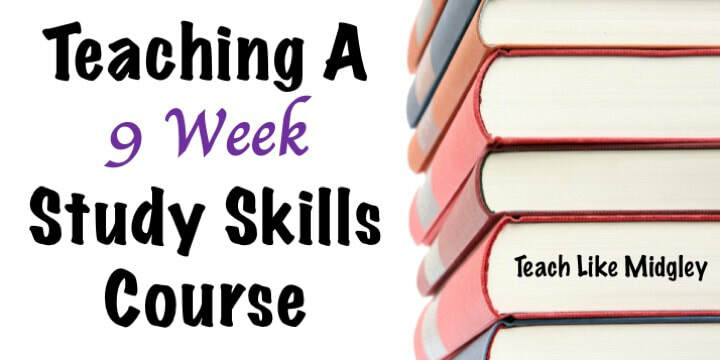 Now YOU can purchase my entire 9 week Study Skills Course Curriculum - HERE!